When you are in the process of purchasing a puppy or a dog, sometimes it is good to hear what others have to say about their own experiences. Here are a few stories to help you gain some perspective as to what dog and resources might be right for you. breeder because she wanted to try and raise a puppy at eight weeks at least once in her life. Another reason she wanted to find a breeder is because she wanted a miniature dachshund and those are hard to come by unless you come across particular breeders. 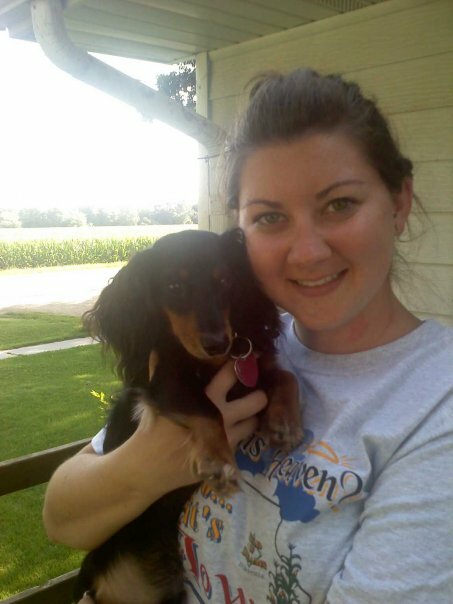 When she began her puppy hunt, she looked at a lot of different places, mostly around Dyersville, Iowa. She found that most of those breeders only had one litter at a time and many puppies were already sold before she could see them. After she brought Jaxson home, she didn’t notice any major health issues until he started vomiting frequently. She took him to the veterinarian and it turned out he was eating food that didn’t agree with his digestive system. Other than that, he had no main health issues. Erin abhors puppy mills and thinks they are a terrible thing. Erin does have some advice for those who are looking to buy a new furry friend. 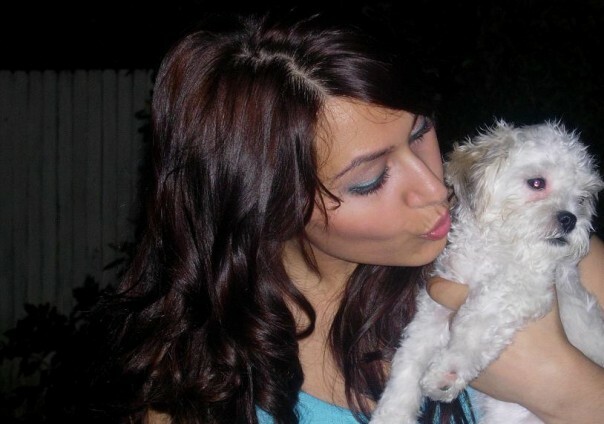 Erika Tahmasebi, a University of Iowa alumni who graduated in 2008, took a different route when finding her true love, Lucy, a maltese-shih tzu mix. Lucy is short for Lucille Lucius Vorenus Bluth and she is now 4 years old. Lucy caught Erika’s eye when she gazed at her through the glass window at Petland one day in March of 2006. Erika used to go to the humane society to play with the animals and would always get upset and leave in tears. Her friend took her to Petland to play with the animals there, thinking she wouldn’t feel guilty when she left. The second she set her eyes on the little maltese-shih tzu mix, she feel in love and purchased her that night. She says there was something about her that made Erika had to have her. The fact she was from Petland made her think twice about purchasing her. Lucy did not have any health issues and Erika feels very lucky about that. She advises other puppy-seekers to go another route than she did. Amy Braun, the pet counselor from Petland in one of the previous stories, wanted a breed that most pet shops don’t carry. 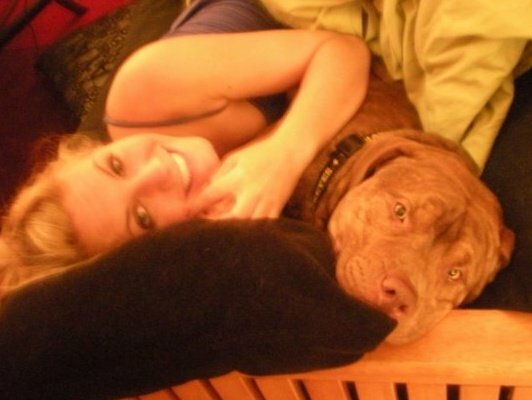 She wanted a pit bull, a breed that many fear because of its “dangerous” nature. She currently has one dog, Loki, who is a mix between a pit bull and a mastiff/Chesapeake bay retriever. Her first pit bull, Killian, was from Animal Control in Cedar Rapids, Iowa. “I wanted to feel comfortable living by myself and nobody was going to mess with me. I wanted a pit bull because they are huge and nobody will mess with them,” she says. She does think that pit bulls are some of the sweetest dogs underneath all that stigma. She let a friend take care of her dog, Killian while she was in Germany for a year and after many attempts of trying to reach her friend, she found out her dog died three days before returning to the United States. Apparently her friend allowed another friend to watch the dog and she had gotten into some antifreeze. She was taken to a vet the next morning, but didn’t survive. When she returned to the states, she went on the dog hunt again. She wanted another pit bull, but had trouble finding one. All the breeders she looked at seemed sketchy except those that lived in Louisiana, Idaho or Ohio. Luckily she knew what to look for when searching for a breeder. She noticed that many of the puppies weren’t checked over by a vet or didn’t include any papers according to the Web sites. They also didn’t come with warranties and the breeders didn’t ask Amy any important questions that she expected. She ended up finding Loki, her current dog, from Cedar Valley Humane Society in Cedar Rapids, Iowa. Loki is a mix and wasn’t what Amy was looking for at the time, but she fell in love with him. He didn’t have any major health issues. Loki does have a chronic ear infection in one of his ears, but compared to all the other things he could have, Amy considers it to be nothing. Amy is appreciative of the way Cedar Valley Humane Society handled everything when she was adopting Loki. Please take a look at the slideshow of some of these adorable lil’ doggies! (Photos were contributed by dog owners). So what should you take away from these other people’s experiences? Different people are better with certain breeds. Research what specific temperaments would be a good match for you and don’t base your decision on how a dog may look. You may think a Golden retriever is gorgeous, but if you live in a tiny downtown apartment and can’t take him/her on walks, you are going to run into some trouble. Not only should you research the breed, but where you intend to get the dog from. Meet with an animal shelter, breeder or pet store owner a few times before you make your decision. Ask questions about the facilities. Make sure they ask you questions. Pay attention to how they treat the purchase – is the puppy they are something they are trying to get rid of and get their cash or do they take a genuine interest in the puppy’s wellbeing with you? It is rewarding when you find the dog that is right for you. With all these new tips and things to watch out for, I wish you only the best when searching for a new furry companion! Click on the following links to read more about Puppy Shopping and Puppy Health Issues. “disposed of” when they can no longer reproduce – sometimes they are shot, abandoned, or in rare cases, relinquished to animal rescue organizations. Veterinary technician Jesse Henderkoff from Bright Eyes and Bushy Tails Veterinary Clinic in Iowa City has seen many dogs in her day and knows what signs to watch out for when purchasing a new pup. She gave me a rundown of some common problems that puppies face, especially those that are bred and raised in puppy mills. BREATHING COMPLICATIONS: An elongated soft palate will interfere with a dog’s breathing. As the surviving mill dogs grow older, they are more prone to developing respiratory ailments and pneumonia. CONJUNCTIVITIS: The membrane that lines the inner sides of the eyeball up to the cornea is called the conjunctiva. If it becomes infected, you’ll notice a discharge from the corner of the dog’s eye. The discharge may be clear and watery or opaque and thick. Typically this is the result of a bacterial infection. Your veterinarian can give you the best diagnosis. GIARDIA/PARASITES: Though an infection with Giardia is not initially fatal to your dog’s health, it can develop into a very serious condition. These parasites are found in dirty or contaminated water. Since the Giardia organisms interfere with the normal absorption of your dog’s food, this can result in malnutrition, weight loss, and other serious symptoms. In addition to this, due to the frequent diarrhea that most dogs experience when infected with Giardia, a dog may also become severely dehydrated. HEART MURMURS: A heart murmur is one of several types of abnormal sounds your veterinarian can hear when listening to your pet’s heart with a stethoscope. Normally, two distinct sounds are heard when listening to the heart of a normal dog. This is normally caused by a turbulent blood flow. Hearing a heart murmur during a routine physical examination will often be the first hint to your veterinarian that your pet has heart disease. This is not something to panic about, but you should get checked out regularly. HIP DYSPLASIA: In dogs, a femur that does not fit correctly into the pelvic socket, or poorly developed muscles in the pelvic area. Large and giant breeds are susceptible to hip dysplasia, and a few smaller breeds suffer from it. In dogs, the problem almost always appears by the time the dog is 18 months old. Dogs might exhibit signs of stiffness or soreness after rising from rest, reluctance to exercise, bunny-hopping or other abnormal gait (legs move more together when running rather than swinging alternately), lameness, pain, reluctance to stand on rear legs, etc. Some dogs do recover, although it can be problematic as the dog gets older. KENNEL COUGH: Also known as canine tracheobronchitis, kennel cough refers to a highly contagious class of viral and bacterial ailments which spreads rapidly among dogs in close quarters, such as in a pet store or veterinarian. Both viral and bacterial agents play a role in the complex, much as in human bronchitis, making the syndrome difficult to diagnose. Once kennel cough has been contracted, the treatment course is much as it is for humans with similar infections. Antibiotics are prescribed if bacterial causes are determined, as well as a week or so of naptime in a freshly scrubbed room away from other dogs. LUXATING PATELLA: The patella is the bone we know as the knee cap. A groove in the end of the femur allows the patella to glide up and down when the knee joint is bent back and forth. In so doing, the patella guides the action of the quadriceps muscle in the lower leg. The patella also protects the knee joint. In some dogs, because of malformation or trauma, the ridges forming the patellar groove are not prominent, and a too-shallow groove is created. In a dog with shallow grooves, the patella will luxate (jump out of the groove) sideways, especially toward the inside. This causes the leg to ‘lock up’ with the foot held off the ground. Smaller breeds of dogs have the highest incidence of patella luxation. NEUROLOGICAL/SOCIALIZATION DISORDERS: Due to the frequently poor breeding conditions in puppy mills, puppies bred there often suffer from health and/or social problems. Puppies raised in a cramped environment shared by many other dogs become poorly socialized to other dogs and to humans. 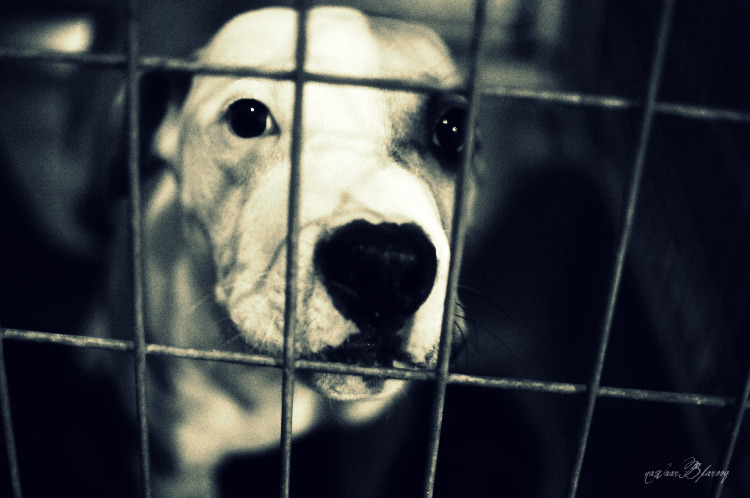 Dogs are then transported over long distances in poor conditions, sometimes resulting in animal stress and death. OVERBITES/UNDERBITES: Puppies and dogs with overbites and underbites may need to have dental surgery because the Constant contact between upper and lower incisors can cause uneven wear, periodontal disease, and early tooth loss. Many times the tips of the teeth are shaved off or the problematic teeth are removed altogether. PARVOVIRUS: Parvovirus is a viral disease of dogs. It affects puppies much more frequently than it affects adult dogs. The virus likes to grow in rapidly dividing cells. The intestinal lining has the biggest concentration of rapidly dividing cells in a puppy’s body. The virus attacks and kills these cells, causing diarrhea (often bloody), depression and suppression of white blood cells — which come from another group of rapidly dividing cells. In very young puppies it can infect the heart muscle and lead to “sudden” death. Vaccinations usually are given at around 2-3 weeks and after the first series of shots, puppies are given boosters every 2 weeks until they are around 13 weeks old. UNHEALTHY COAT: What a dog looks like on the outside is likely an indication of what is going on in the inside. If a dog’s coat is matted, dull or has an unkempt appearance, chances are that the animal is unhealthy and should be looked at by a veterinarian. The dog may need more fatty acids and nutrients in its diet than what it is getting. These are just some of the symptoms and conditions that puppies and dogs from puppy mills might exhibit. 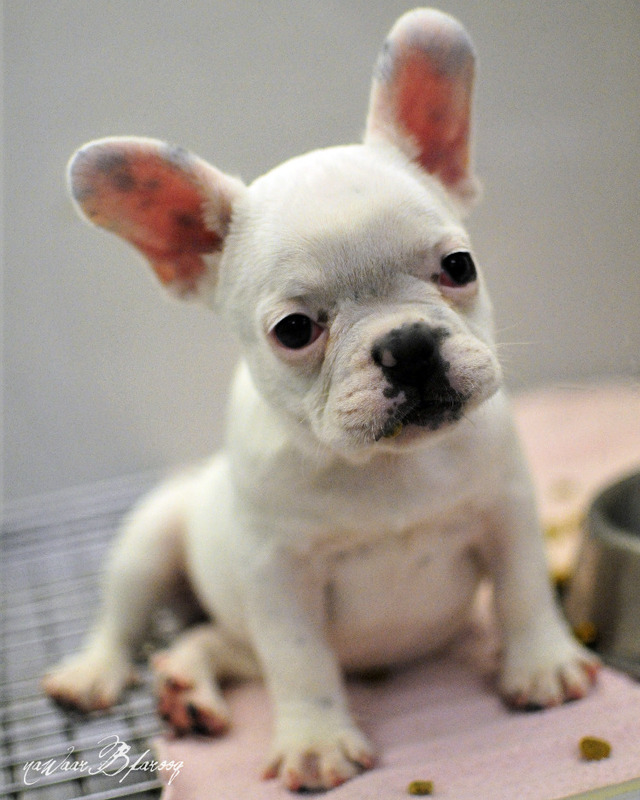 Other puppies born in normal conditions may have these conditions as well, but these are just some of the most prevalent ones found in puppy mill puppies. There is no reason these dogs and puppies should be subject to these conditions. The new legislation regarding puppy mills should be very beneficial in curbing many of these commercial breeding facilities where dogs are produced for quantity and profit. Click on the following links to read more about Puppy Shopping and Experiences of Dog Owners. I know I’ve been there. I go to the pet shop and I want to play with at least four puppies, two of which I normally contemplate taking home with me. In fact, one time I did do just that. However, there are many things to consider when buying a puppy. They aren’t just something you can toss to the side when you get bored with them. They need attention and care, just like us. When you are considering getting a puppy, you should know about where you are buying from. Many people think they know the right answer when the go looking for a pet. Purchasing puppies and dogs without having any idea of their background and history can be dangerous and you might wind up with a dog from a puppy mill. What is a puppy mill, you ask? A puppy mill is pretty much like a farm for dogs, and not one of those cozy, homey ones. It is more like one of those giant cattle farms where the cows are mass bred to be slaughtered for your dinner at night. Not a very pretty sight. What’s especially scary is that Iowa has the third largest number of puppy mills in the nation with more than 400 facilities. To be an educated puppy buyer, you must know where you can get dogs. There are three main places that most people look. 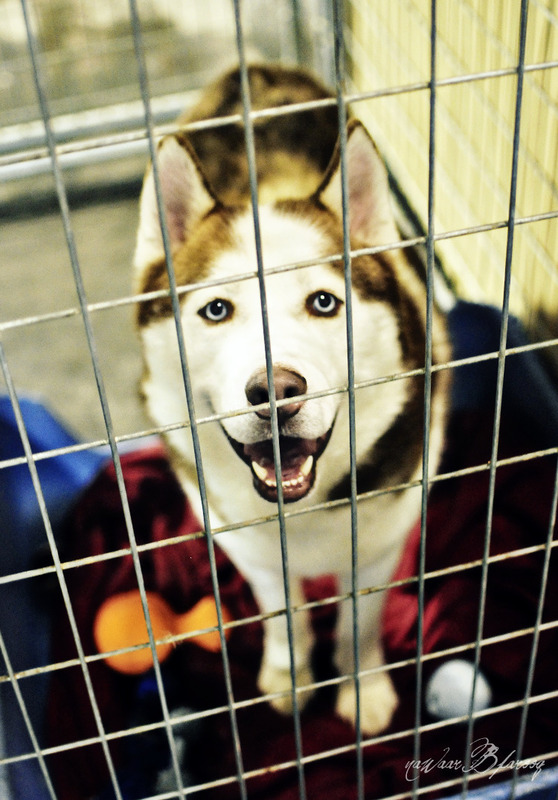 These include pet shops/commercial kennels, breeders and animal shelters. After talking to many people about where they buy their puppies and talking to people who sell puppies, I’ve come up with a list of things you can expect when you go to each of these places seeking a pooch. Keep in mind that all of these can be viable resources if you do your research and pay attention to some vital signs. Many people like seeking breeders when looking for a new pet. Breeders can be tricky. Some breeders are essentially mass breeding through puppy mills and they have Websites that look amazing. People can get fooled by these Web sites and assume that these are reputable breeders. However, really they are just puppy factories waiting to ship out many litters to whoever will take them. So how do you tell if your breeder is a good one that you can trust? Here is a list of things you should look for when getting a puppy from a breeder according to pet counselor Amy Braun from Iowa City. what your housing is like and what kind of guests you normally have. They want to know this so they know that the puppies they are offering go to good, safe homes where they will have a good life. If your breeder doesn’t ask you questions about yourself, stay away! Good breeders will often provide a warranty or guarantee of some kind. The best breeders will offer lifetime guarantees, but even if you are offered one for a year or a few months, it is a good sign. If for some reason you absolutely cannot keep your dog, a good breeder will take back the dog, even if they didn’t actually breed the dog. Many good breeders are also involved with rescuing whatever types of dog they breed. This isn’t a surefire way to tell if your breeder is a good guy, but it definitely earns them some points. Another option when purchasing a new pup is to go through a local animal shelter. Iowa City has one called the Animal Care & Adoption Center. Maggie Winegarden, a temporary animal center assistant at the City of Iowa City Animal Care & Adoption Center has been working there for two years and thinks animal shelters are a great resource when looking for a new pet. Why not adopt a dog that already exists instead of constantly trying to produce new ones? Here are a few of the other reasons she gave as to why people should look to animal shelters when looking for a new furry companion. These animals already exist and are in need of a permanent, loving home. 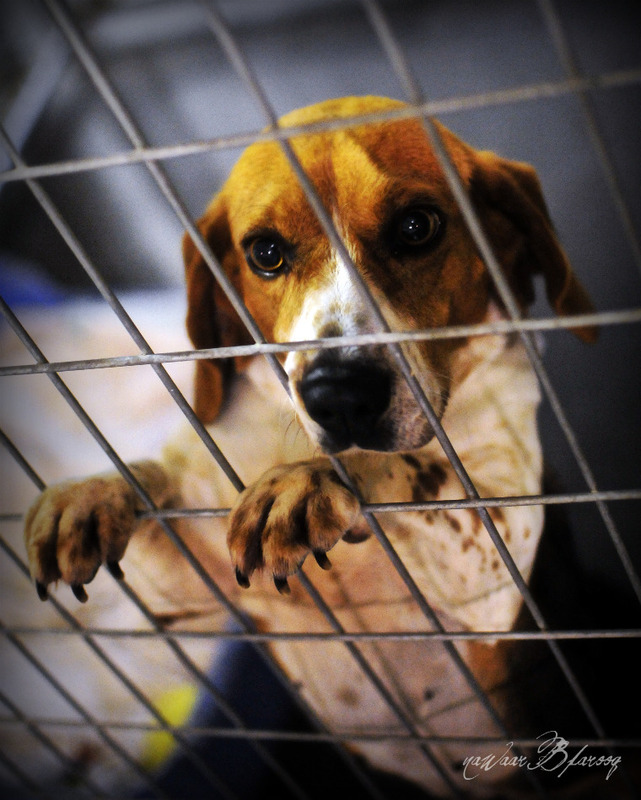 Puppy mills are rampant in Iowa. When you go to a breeder or pet shop and don’t do your research, you may end up with an unhealthy, unsocialized dog that will cause you more problems in the long run. When you get a dog from the animal shelter, you have a history of where they are from and a good idea of what their health is and any behaviors they exhibit. Their temperament is thoroughly tested. When you get really young puppies it is harder to tell sometimes. You can’t usually tell a puppy’s personality until they are about 6 months old. Volunteers at the adoption center constantly work with puppies to be socialized (if they are not already) and are taught basic commands. You usually can’t assume that when buying from any breeder or pet shop. The adoption center also offers financial assistance for spaying/neutering to prevent having any unwanted litters. Another option that you can look to (but might want to be wary) of is purchasing a puppy from a pet shop. There have been rumors that many commercial kennels take puppies from puppy mills and because of that pet shops have received a bad rap. Of course, this isn’t always true, and with any situation, it is the consumer’s responsibility to do their research before taking on such a hefty responsibility. I have purchased a puppy from a pet shop and haven’t had any issues so far, but I was as careful as I could be when I did. There are local pet stores and franchise pet stores. Both can have a great pet waiting for you inside and some can have sick animals. You should never buy a pet on impulse, no matter how cute they are. Instead, make sure you get the breeder history (if possible), so you know what breeder the puppies came from. Pet Counselor Amy Braun used to work at Petland in Iowa City. She knows about the stigma attached to Petland and its rumored association with puppy mills. “ With how much they are talking about puppy mills in the news, it leads the viewer to believe that puppy mills are around every corner,” she says. Amy doesn’t believe that is the case and supports buying puppies from pet shops like Petland. Hopefully that has given you some insight as to what to look for when you are on the hunt for a new pet. Just remember to do your research and don’t buy the first puppy you see. Each of these places can help find a healthy puppy/dog a new home, but it is up to you as a smart consumer to decide which resource is right for you. Click on the following links to read more about Experiences of Dog Owners and Puppy Health Issues.